Tamara currently l ectures in the Foundation Programmes in Business and Computing with a specific focus on subjects related to Economics, Finance and Accounting. She has also assisted with classes for the HND and BA (Hons) International Management and MSc International Management programmes. Having completed her MSc International Management with a first-class degree, Tamara went on to take her second Master's degree in Finance and Accounting at the University of Economics in Prague, majoring in corporate finance and banking and insurance. 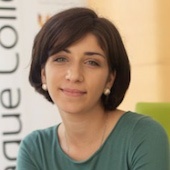 Her main fields of interest are regulation of financial markets and analysis of crisis of 2007-2008. Her current research topics include macro-prudential policies, cost of equity and research in areas of business valuation such as valuation of banks and internet companies. Previously, Tamara was working as Admission Specialist at Prague College and was assisting with classes at HND, BA and Master level. Currently, she hold a position of Associate Lecturer majoring in Finance and Accounting. She is mainly lecturing at Foundation programmes in Business and Computing with the specific focus on subjects related to Business Economics and Accounting.